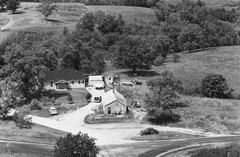 Vintage Aerial, of Perrysburg, OH, has an archive of over 25 million aerial photographs, mostly of rural America, taken during the second half of the 20th century. They are in the long process of scanning and digitizing all these photographs; however, they are able to provide high quality prints of any photo in their archive in a matter of days. You can browse through the thousands of photos they've digitized; but, your best bet is to contact one of their Librarians to help you find that photo of your grandparent's farm or whatever you seek. Below is their coverage map (as of June 2011), with blue shading to indicate counties in which they have photographs (the darkest blue means there are over 10000 photos available within that county). My first experience ordering a print from Vintage Aerial was awesome and I couldn't be happier with the framed print I received. I chose to go with a sepia print with an oak frame; I think it looks really sharp. I went to their Discover Your Photos page and selected Boone County Missouri. The Boone County page told me there were thousands of photos available in the years 1979, 1986, and 2001. So I was hopeful at least one would be of Rucker, the little town my paternal grandparents bought in 1946 (of course, all that was left of the town was the grocery store with gas pump and the house) and where they lived for the rest of their lives. As a kid, my parents left me there for a week every summer (and another week with my maternal grandparents about 20 miles west), and we spent most Christmases and many Thanksgivings there; so there are a lot of fond memories there for me. Anyway, I filled out the contact form and a detailed location description for Rucker. Within a day or so, Librarian Tom Wolff contacted me via email to confirm the location; then only a couple days later called me to view a slide show online of the photos in the 1979 film roll whose flight path covered Rucker, which they had scanned just for me! Tom gave me a slide show code and told me where to enter it on their home page, and soon I was viewing aerial photographs of north-western Boone County as it was in 1979. After looking over several photos (many of places I recognized), THERE IT WAS! It is impossible to describe the overwhelming emotions of seeing Rucker on a typical summer day back when my grandparents were still there. There was my grandpa's tractor. There was Aunt Ruby & Uncle Virgil's 1940-something Plymouth parked in its typical spot when they visited from down the road. Oh, and there's … it just went on and on in my head, even though all I had was a scaled-down (to fit in my browser) photo to look at! Tom showed me how the photo of Rucker would look in black&white vs. sepia, and how each would look with the different frames they offer. It was very easy to place the order; and the print arrived within a few days, very securely packaged and in excellent condition. I couldn't be happier with it! I'll admit the prints are a bit pricey, since Vintage Aerial is a fairly new company just beginning to tap into the 25 million images they have acquired; but remember that the price includes professional framing … and the hours you will spend looking at the print and sharing it with friends and family are PRICELESS. That is glare from my flash on the print, not a big white spot in the print itself. Most Mondays, on the Vintage Aerial blog, they have a little contest called "Mystery Monday" in which they show a photograph and challenge anyone to find out (or remember) the location of that photo. I love the challenge of finding various hints in the photo that help locate, or at least date, it. I love it so much, I have a Mystery Monday page devoted to that contest. While trying to solve Mystery Monday challenges or whenever I'm browsing the Vintage Aerial photos online, I like to keep track of certain photos I find interesting, unique, awesome, whatever. I have several Vintage Aerial Photo Gallery pages here to keep track of such photos. Occasionally the aerial photographer chooses to take a photograph of something other than buildings. I love old country church buildings; but, I find all church buildings interesting, either from an architectural perspective or an anthropological one (or both). Places I think look like extraordinary locations to live or work. Not all buildings are bland amalgamations of rectangles. Aerial photographs of bridges are relatively rare. Barns or other farm outbuildings sporting painted or shingled advertisements. Not signs about the farm or business located within, but a paid advertisement (usually the payment was solely having the barn/outbuilding painted or roofed for free). Drive-in movie theaters, lost pieces of Americana. Photos I like or find interesting that don't fit into any other category.